You are buying the Dechra Eicosa3FF SnipCaps For Cats And Dogs Under 60lbs 120ct, model #FFACS120. At ADW Diabetes, we offer a wide selection of Dechra products for cats and dogs. Shop with ADW Diabetes and save on all of you pet health care and grooming supplies. The Dechra Eicosa3FF SnipCaps For Cats And Dogs Under 60lbs 120ct is used to aid the immune system and joint health for normal daily activity of animals. 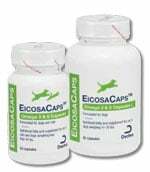 Eicosa3FF SnipCaps provide a concentrated source of beneficial Omega-3 Fatty Acids in a free fatty acid form, requiring less steps before absorption. High concentration of fatty acids to allow for more efficient dosing and lower risk of digestive upset. Antioxidant activity to eliminate free radicals and support for the immune system. Quality, optimal, renewable fish source.